LONDON (AP) — Facing its first challenge of the Olympics, the U.S. women’s basketball team turned up its defensive pressure and turned away Australia. Trailing early in the second half, U.S. coach Geno Auriemma turned to his Olympic rookies and the group — led by Tina Charles and Lindsay Whalen — pressured the Australians into turnovers and bad shots, sparking a pivotal scoring run in the third quarter to help the U.S. beat Australia 86-73 on Thursday. The Americans, playing for a fifth straight gold medal, will meet the winner of the France-Russia semifinal. Australia went right at the U.S. behind 6-foot-8 Liz Cambage, but the Americans’ depth and pressure defense wore down another opponent. The Australian’s budding star scored 19 points in the first half and Australia led 47-43 at halftime. But the Americans held her scoreless in the second half. The Americans had cruised through their first six games winning by an average of 38 points before facing the No. 2 team in the world in the semifinals — a round earlier than they had met at the past three Olympics. With the U.S trailing 56-55 in the third quarter and star Diana Taurasi sidelined with four fouls, Auriemma turned to his bench. The reserves responded, sparking the game-changing run. Whalen started the 16-6 burst by scoring the first six points and Seimone Augustus chipped in another four to help the Americans build a 65-59 lead at the end of the third quarter. They also cranked up the defensive pressure; Australia shot just 4 of 18 from the field in the third. The U.S. extended its lead to 11 on Charles’ two free throws early in the fourth period and Australia could only get within nine the rest of the way. The Americans improved to 7-0 all-time in the Olympics against Australia. Charles and Taurasi each scored 14 for the U.S. Sue Bird finished with 13 points. The Americans have won the last four golds and 40 consecutive Olympic contests dating back to the bronze medal game in 1992. The top two teams in the world had met in the previous three gold medal games with the U.S. coming out on top. This was the first time they had played in the semifinals since 1996. Cambage, making her first appearance in the Olympics, was unstoppable in the first half. She was able to catch the ball close to the basket and the Americans couldn’t contain her. She made eight of her 12 shots to give the Australians a four-point lead at the break. Australia shot 61 percent in the first half, but only had nine baskets in the second half. “They started playing zone and that threw us off in the third quarter,” said Cambage, who’s only shot of the decisive period was a wild 3-pointer with the shot clock running down. Lauren Jackson finished with 14 points for Australia. A gold medal is one of the only things lacking from Jackson’s impressive career. She’s won a world championship, two WNBA titles and is the Olympics all-time leading scorer. Yet she’s come up just short in her four Olympic appearances against the U.S. 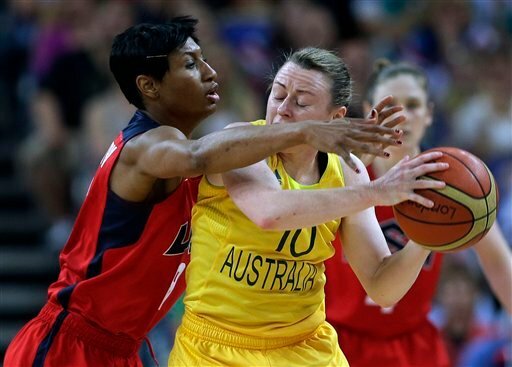 The Australians have already had the two most memorable moments in women’s basketball at the Olympics. Belinda Snell hit a 50-foot heave to send a game into overtime and Liz Cambage had a dunk against Russia, which might have been the first in Olympic history. For one half, they looked to be on the verge of another unforgettable moment — an upset of the favored Americans. Instead, they ran out of gas. Australia came into the London Games off a disappointing fifth place finish at the 2010 world championship. The Australians are missing star guard Penny Taylor, who tore her anterior cruciate ligament in the Euro League finals in April. They lost a pool game to France — the first time they were beaten by a team other than the U.S. in the Olympics since 1996.